The LEN Super Cup will take place in Budapest on Friday as Champions League winner Olympiacos will face Euro Cup winner Ferencváros. Both sides and the organisers believe it will be the festival of water polo. 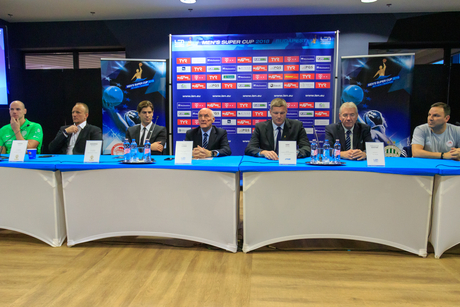 The press conference was held at Groupama Arena Thursday afternoon. From Fradi’s side, coach Zsolt Varga, captain Dénes Varga and president of Ferencváros’ water polo section Norbert Madaras, from Olympiacos’s side, coach Theodoros Vlachos spoke about their expectations of this game, while LEN TWPC Chairman Gianni Lonzi as well as the president of the Hungarian Water Polo Federation Attila Vári and LEN Bureau member Aleksandar Sostar were also on the podium. Norbert Madaras is really proud of his team as they were facing relegation from the Hungarian National League five years ago and now they are here, two time Euro Cup winners and Hungarian Champions, going up against the Champions League winner for the second time a row. They are very happy to organize this event alongside the Hungarian Federation. Attila Vári said it is their pleasure to host this huge event and he is sure that this game will help popularize this sport. Vári hopes that after Dunaújváros won the women’s Super Cup two weeks ago, Fradi can do that as well. Aleksandar Sostar mentioned that this will be a water polo festival on Friday and the two great teams can guarantee that this game will be on the highest level of water polo possible. Gianni Lonzi also wanted to thank the teams and the federation for organizing this event and he believes that Ferencváros and Olympiacos can serve the fans well in the Super Cup. According to Theodoros Vlachos, the Greek team is highly motivated to take home the Super Cup trophy and to win this battle in one of the most famous pools in the world – Császár-Komjádi Sports Swimming Pool. They had some trouble in the beginning of the season with their practice times, but they are back on track again. He believes that their opponent’s greatest strength is on offense, but the Greeks will try to stop them with their stellar defense, so the winner of this matchup might decide the game. As for the Hungarian coach, Zsolt Varga said that it is an honor to play in the Super Cup and both teams are highly motivated because they could not win this trophy for a long-long time, so everyone will give everything they have got. Zsolt Varga mentioned the biggest factor in this game might be the man-up situations and how each team manages to score and defend in these situations. Coach said that they are in great physical condition and this could be an advantage for them. Captain Dénes Varga also highlighted their physical advantage and that they are extremely motivated because they could not seize the unique opportunity in last year’s Super Cup. The LEN Super Cup will take place in Császár-Komjádi Sports Swimming Pool on Friday (2018.11.30) at 20:00.